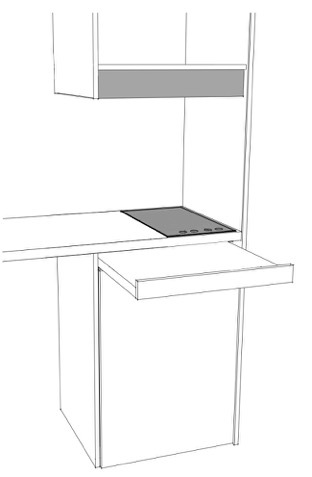 Monobloc kitchen just 94cm in width , for all facilities and public offices, studios, schools, pied-a-terre. Fitted into apartments for tourists . Kitchen closed retractable closed cabinet with shelves and wooden doors listel. Complete with : refrigerator, sink with a bathtub, shower mixer with removable steel rod with hooks tool holder. Suction filter and hood, two shelves. We only use plywood - this is the kitchen-cabinet smallest of our line, provided all the basic electrical and quality. Some may apply for optional : perimeter h.40cm top, microwave oven steel. NB : annealing of another column.